At this point it might take a dead body to get the Big Three (ABC, CBS, NBC) networks to give the IRS-Tea Party scandal any sort of real coverage. 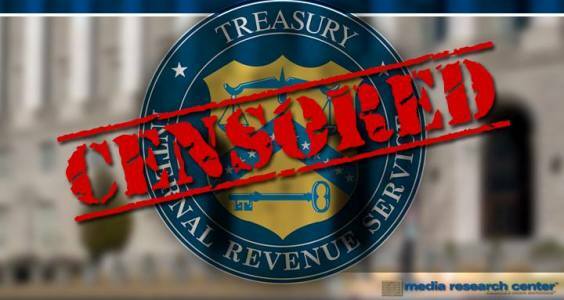 Huge developments in the last week – like IRS official Lois Lerner receiving a criminal referral from the House Ways and Means Committee and e-mails proving she fed tax information on a targeted group to the staff of Rep. Elijah Cummings (D) – were completely censored by ABC and NBC news. Only a 90 second report on Thursday’s CBS This Morning kept last week’s revelations from being totally blacked out on the Big Three networks. ■ The House Ways and Means Committee voted to refer former IRS official Lois Lerner for criminal charges. ■ E-mails proved Lerner fed tax information to Cummings’s office about voter fraud prevention group True the Vote. ■ E-mails showed Lerner talked about taking a job with Barack Obama’s advocacy group Organizing for Action – while she was investigating non-profit applicants. This entry was posted in HYPOCRISY WATCH, POLITICAL and tagged Censor, IRS, Networks, Omission, scandal, Tea Party. Bookmark the permalink. The Fugitive Slave Acts of 1793 and 1850.